The very heart of the Milky Way, at the center of both the disk and bulge, is almost impossible to study in the visible wavelengths. Interest in this region has been high, however, since the 1950s. That's when astronomers found a strong, compact radio source in the direction of the constellation Sagittarius—a radio signal not associated with any known star or stellar remnant. The source is known as Sagittarius A*, pronounced ''Ay-star.'' The unusual characteristics of Sagittarius A* have long fueled speculation that the center of the Galaxy harbors an exotic object called a black hole. The source lay in the direction of the center of the Galaxy but, without knowing how far away it was, the investigators and other astronomers were initially cautious about identifying it with the nucleus of the Milky Way. They were tempted to do so, however. At about the same time that Sagittarius A* was discovered, astronomers had found that some strong radio sources in the sky corresponded to the cores of nearby galaxies. By 1960, the consensus was that the source of the radio signal coincided with the center of the Galaxy. 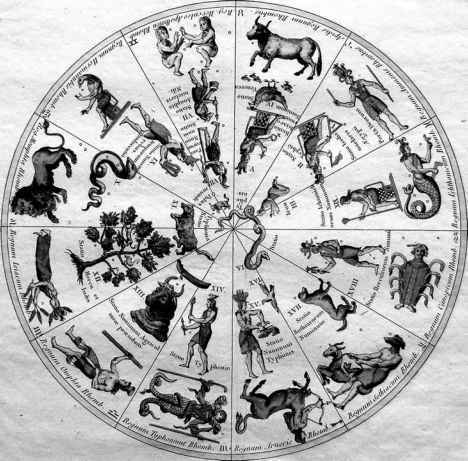 The Dutch astronomer Jan Oort, writing in a popular text of the late 1960s, said of this ''striking'' source, ''As far as we can judge it lies precisely in the direction where the center of mass of our Galaxy is thought to be, and is probably connected with this. ''14 In 1971, Donald Lynden-Bell, then at England's Royal Greenwich Observatory, and Martin Rees at Cambridge University laid out persuasive arguments for the existence of a black hole, surrounded by a ring of dust and gas, at the center of the Milky Way and at the origin of the Sagittarius A* source.15 However, as late as the mid-1980s, many astronomers doubted the existence of a black hole at the center of our galaxy, and sought alternative explanations for the unusual characteristics of Sagittarius A*. ''Black hole'' is the term usually applied to a massive star that has collapsed under its own weight so that its gravity, which arises from its mass, is unusually concentrated. Dust and gas molecules and matter particles making up the star cannot escape, and matter outside the black hole that comes within a certain radius will be forever trapped by this extraordinary gravitational field. Even light waves coming from the collapsed object are bent back into the gravitational well—hence the name ''black hole.'' Supermassive black holes, which is a more accurate term for black holes at the centers of galaxies, are black holes that formed not from a single star, but from the collapse of a giant gas cloud or star cluster, or perhaps from the merger of two galaxies with small black holes at their centers. Both kinds of black hole may grow by accreting gas and stars, or by mergers with other black holes. In the 1970s, astronomers understood the basic properties of black holes from a theoretical standpoint, and were still searching for evidence of their existence. Their reasons for suspecting that a black hole might lurk at the center of our galaxy and at the centers of other galaxies included strong theoretical arguments and some observations indicating that the central object was very compact. The development of infrared and sub-millimeter imaging technology in the 1980s and 1990s has allowed us to part the curtains on the center of the Galaxy and the area around the supposed black hole, just as it provided the first view of the bulge itself. Since the mid 1990s, astronomers have exploited that view to build a substantial body of knowledge about the galactic center and to amass very strong evidence pointing to a supermassive black hole. They're still working on it, but the picture they are piecing together shows a cornucopia of odd and uncommon objects surrounding the black hole candidate at the center (figure 10.8). If we were to approach the center of the Galaxy from somewhere deep in the bulge, say about 500 light-years from the galactic center, the first thing we would notice would be the very high density of stars — mostly rather cool, yellowish stars — and their increasing concentration as we traveled farther in. But stars are not the only denizens of the inner bulge. 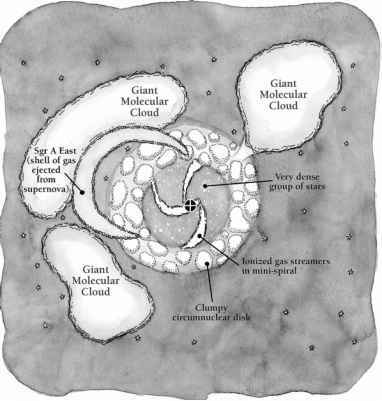 If we had the ability to see various types of molecules, we would also observe giant gas clouds as we sailed through them, warmer and denser than those elsewhere in the disk, and very turbulent. We would continually be buffetted by long filaments and arches of gas coming at us from all directions, ghostly shells of material cast off from supernova explosions. Looking up, out of the plane of the galaxy, we might observe giant bubbles shaped by magnetic fields, expanding out and away from the galactic center. If we were equipped with x-ray vision, we would notice around us an intense flickering light from several isolated sources. The x-rays probably arise from heated gas feeding stellar black holes or neutron stars. in the general direction of the galactic center. Our ride might deposit us at a point about 25 light-years from the galactic center. There we would find ourselves in a vast rotating ring of gas and dust clouds. This is the circumnuclear disk. The clouds within the circumnuclear disk are about a light-year across, on average, and they bob up and down as well as rotate around the galactic center at speeds of about 100 kilometers per second. The disk probably draws material in from some of the outlying molecular clouds, through the river or streamer of gas. The circumnuclear disk has a distinct inner edge at about 5 light-years from the galactic center. Crossing this boundary, we would find that space appears to have been swept clear of much of the gas and dust that we noted in the disk and beyond. This region is sometimes called the central cavity. The cavity is not completely empty, however; it is only low in interstellar material. Hundreds of thousands of stars swarm in this space. Many are red giants and some, very close to the center and the Sagittarius A* source, are young massive blue stars. Recent observations have also delineated three arc-shaped streamers of ionized gas in the central cavity. The streamers have the shape of a mini-spiral, and they appear to converge at the location of the proposed black hole like streams of bath water headed for the drain. These streamers are apparently funneling gas from the circumnuclear disk to the black hole, just as the 30 light-year-long streamer seen outside the disk may connect the disk to a source of material in one of the giant molecular clouds. What of the black hole that we suppose is at the very center of the Galaxy, our journey's true heart of darkness? The black hole itself remains difficult to visualize and impossible to image with telescopes and detectors. Within a certain perimeter of a black hole, called the event horizon, everything belongs to it. Outside the perimeter, stars or gas clouds can orbit a black hole as they can any other massive body. Contrary to the popular imagination, a black hole is not like a malevolent vacuum cleaner, capable of sucking up everything around it. However, any star whose orbit takes it within the event horizon will add to the black hole's mass—and that will enlarge the perimeter, albeit by a very small amount. So, as long as there are stars (or gas clouds) nearby to feed on, a black hole may grow by enlarging both its mass and its perimeter. A few still doubt the existence of a supermassive black hole at the center of the Milky Way. However, recent observations have provided the best evidence yet for its existence. As observations fill in more details, it may become possible to rule out alternative explanations for the proposed black hole — alternatives such as a concentration of neutron stars or other massive, low-luminosity objects. We may also gain a better understanding of the energy balance at the core of the Galaxy. At present, it seems that the black hole, while radiating powerfully in the long wavelength or radio part of the spectrum, is less bright than expected in the shorter wavelengths. It may be radiating energy less efficiently than predicted, or it may be ''starving'' — unable to satisfy its appetite for gas because of strong stellar winds keeping material out of its reach.